Let me start off by saying that Telltale has done it again. When I started this game, I thought to myself "There is no way this game can be better than The Walking Dead. ", but I was proven wrong. If future episodes can keep up with the same quality as Faith, The Wolf Among Us will be the best game Telltale has made to date. At the end of the episode I felt so invested in these characters, even more than I was with Lee and Clementine. It was a bitter sweet though, I wanted to pull my hair out as I sat there helpless on the couch knowing I wouldn't be able to play the next episode right away. The Wolf Among Us is based off of Bill Willingham's Fables comic book series. If you haven't read them (which I highly recommend you do they are great) don't worry, the game takes place 10 years before the comics to keep newbies from feeling like they are missing out on the story. Here's a quick rundown of what's going on. All of the fairy tales have been forced out of their homelands and have been living in a small community called Fabletown in New York for hundreds of years. For some fables like Snow White, blending in to the normal world is easy. However, for others such as Mr. Toad, they must use expensive "Glamour" spells to keep their true identities a secret. You play as Bigby Wolf (aka The Big Bad Wolf), the sheriff of Fabletown. Bigby makes sure everyone follows Fabletown law and doesn't attract unwanted attention from the "mundies" (normal people). Without getting into any spoilers, there is a murderer in Fabletown and it is up to you to figure out who is the one behind these cruel actions. Gameplay wise, it's exactly like The Walking Dead. Choice and consequence based storytelling, quicktime events, and the occasional roam around looking for things. For people new to this type of game, it may seem like there isn't a whole lot to do, but once you actually start to play and see your decisions affect the story, it becomes addicting. Telltale does a superb job making sure every choice you make has an impact. 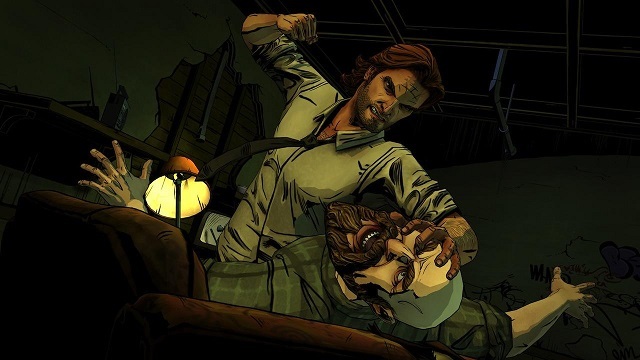 Whether it's something as minor as changing the conversation or something much more drastic like getting someone killed, it makes you think carefully about what decisions you make and what kind of character you want Bigby to be. Along with the great story-telling, The Wolf Among Us looks amazing. It makes you feel like you are inside of a comic book, vibrant colors and and the heavy cell shading make the perfect atmosphere for this game. The music is also top notch, 80's synth combined with the dark ambient sounds create suspense and tie so well into the overall mood of the game. Voice acting is phenomenal, bringing these characters to life. From beginning to end, you won't be disappointed. On my second playthrough I played on my Xbox 360 and did notice framerate drops and slow loading (an issue for all Telltale games on consoles), but you shouldn't let that stop you from enjoying a great game. For anyone who loves choice based games, The Wolf Among Us is a must buy. To anyone else who is on the fence, I would still recommend this game in a heartbeat. For $5 it's just too hard to say no. - Choices have weight to them. - Framerate issues and slow loading on consoles.